The reopening of this Michelin-starred restaurant is well worth the wait. Talk about timing—just as it was announced that Béni received a Michelin star in mid 2016, the restaurant had to close for a lengthy renovation that left plenty of diners little chance to discover the genius of chef Kenji Yamanaka. The restaurant quietly reopened in late December revealing a new look and dining experience, and of course, the question came up: Is better than the original award-winning formula? That, you'd have to find out for yourself, but here are 6 good reasons—apart from the obvious accolade—why we suggest you book a table at Béni (fast!). Like its move up in the culinary world, Béni transferred to the second floor of Mandarin Gallery, the former location of fine dining Japanese restaurant Hashida Sushi. The new space is brighter and enjoys a larger square footage, which, in turn has expanded the seating capacity from 15 to 24. Albeit the expansion, the experience remains wonderfully intimate. Each of the two private rooms can now accommodate 8 diners, while the handsome wooden counter takes another 8 guests who have a bird’s eye view of the minutiae in the kitchen. Nothing has changed… when it comes to the quality of the food at least. Driven by seasonality, ingredients are still air-flown from both France and Japan, guaranteeing a great foundation for chef Yamanaka to create his delicious plates. 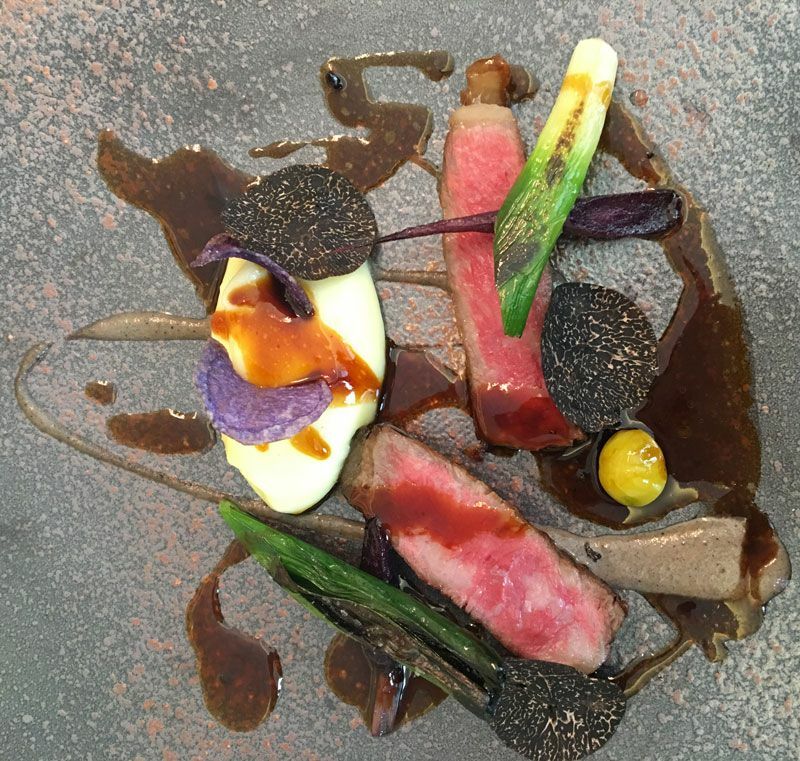 The refined French-Japanese cuisine that charmed Singaporean diners and the visiting inspectors has been elevated even further with intricate dishes such as Vegetable Garden, which features 25 types of vegetables in various preparations. Three words: Ozaki A5 Wagyu. Béni's signature dish is still the highlight this time around, and rightly so. It's an open secret but we have the restaurant to thank for being the first to bring this delicacy from Miyazaki, Japan to Singapore. Money alone cannot grant access to Ozaki beef; a chef must prove their worth to Ozaki-san before he agrees to sell the coveted produce. Chef Yamanaka is one of the chosen few who get to cook this prized wagyu, and once you taste the dish and partake of it in silence (as most diners do), you’ll understand why it's held in such high regard. Apart from the uplifted interiors, every detail of the experience was also given an aesthetic upgrade. From the handmade plates from Kamachi, Japan and the mouthblown glassware from Sugahara to the exquisite bespoke Takamura knives that chef Yamanaka himself designed (which serves as the perfect implement to slice the Ozaki wagyu with), the finishing touches were clearly given more thought than in the original restaurant and complements the carefully-prepared food. Sake is a given at a restaurant of this calibre and Béni has plenty to appease connoisseurs. In keeping with its goal to surprise, however, chef Yamanaka has created tasting courses paired with the exquisite Royal Blue Tea. The fine, high-quality tea is only available in two other restaurants in Singapore—Hashida Sushi and Restaurant André. Essentially, it's a tea that's as discerning about its partners as you are about your food. The suave hospitality from the team, led by General Manager Antoine Capellli, is one of the main draws of the new Béni. The service is assured yet warm, confident yet convivial and creates a dining experience that's relaxed and enjoyable as a fine dining meal should be. Their desire to please extends to the restaurant’s drive to be inclusive when it comes to price. For example, the updated wine list features a larger selection of wines by the glass; they've also actively sourced from smaller growers and winemakers who adhere to natural methods—60 per cent of the list are biodyamic wines—all at prices so reasonable you’d actually look twice. Digest Where Will You Be Dining This Gastromonth?